Don’t get me wrong, Google Maps finds my apartment just fine. Heck, it even has my exact building. But that is only half the value of an online map. The real value is directions. This is where Google maps falls apart. Imagine you want to take the train somewhere. Google Maps has you covered. It’ll show you where the stations are, the departure times, and the price of the ticket. That’s great. Yes, it is telling me to walk half the distance to my destination in the wrong direction, take the train just one stop and then get out and walk half the distance to my destination again. The math wizards out there will note that I end up walking just a much. Of course that math won’t tell you I’ll have to wait for and pay for a train. 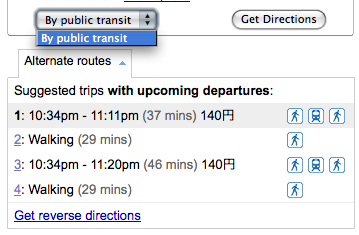 More frustrating is the they Google Maps offers a little pull down menu that appears to have options other than going by train. However, this is a trick. The only option found in the menu is public transportation. You can also see here that walking is much quicker. Even though Google Maps acknowledges I can walk there it stubbornly refuses to map a walking route, instead it offers a giant swooshing arrow. What do they expect? Maybe for me to exclaim, “Oh…. up! I see now! I couldn’t have figured that one out on my own because I am the stupid person within ten thousand light years of here, thanks so much.” I won’t do it. No way. 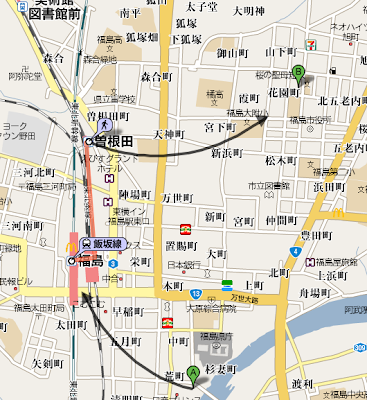 While I can easily work without any directions in this instance, longer trips become more problematic. In fact what I’ve learned is that if I want to figure out how to get somewhere in Japan by car or bicycle I have to use MapFan. MapFan is a bit harder for me to use and its maps aren’t as pretty, but it gives me options other than public transportation. Ignoring the arguments about whether Google is as good as they claim to be, one has to admit that they have a sense of humor. 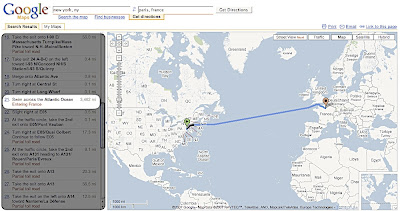 Take for instance their directions via google maps to get from New York, NY to Paris, France. I don’t know why I’d never considered just swimming the 3,462 miles to save on that costly plane ticket. My brother showed me a couple of other cases of slightly evil and very evil being kind of funny. One is the now famous “Wooden Spoon Prank” check you tube for the dozens of people trying to imitate this. The other is less known, but about a thousand times more evil. It is actually only borderline funny because it is so mean. And of course all of this is courtesy of youTube, which is owned by Google… along with the other third of the internet. A couple of days ago I was on the NY Post website for some reason and I bumped into something that creeped me out. The NY Post is offering a Celebrity Sightings map which uses the power of google maps. Anyone can submit their sighting of stars in New York city. Not too useful for most folks but it should give stalkers a leg up. All a stalker needs to do is keep track of their favorite celebrity for a few months to build up some patterns and blamo! they got everything they need. It is about time people start harnessing the power of the internet for evil. Not inclined to stalk, but scared of unamerican activities? Now you can finally track those socialist son-of-a-guns in the movie industry from the comfort of your own home. What’s more, you can avoid the business where they go (clearly they are sympathizers! ).